Arentus Falvius is an Imperial sorcerer and Primate of the Great Chapel of Talos in Bruma. He wears a green brocade doublet with a green silk garment along with a pair of green velvet shoes. He carries a Bruma chapel key along with a modest sum of gold. As a sorcerer and Expert Conjurer, Arentus possesses a wide range of spells all of which are level-dependent. He knows how to summon major Daedra and can cast major spells from the Alteration, Conjuration, Destruction, and Mysticism schools of magic, as well as minor spells from the Restoration school. He offers advanced training in Conjuration, and has gained quite a reputation among the citizens of Bruma for his ability: "I've heard that Arentus Falvius at the chapel can conjure up creatures", "Apparently, Arentus Falvius at the chapel is quite a conjurer. He'll even teach the skill to those he likes" and "Is it true that Arentus Falvius will teach people conjuration?" are some of the things they say about him. Arentus introduces himself by saying "Praise Akatosh! Praise the Nine! 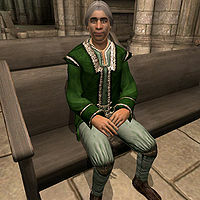 I'm Arentus Falvius, primate of Talos, High Priest of Bruma Chapel." He has a disdain for the local religions: "I'm here to show Bruma's errant Nords the path to the true faith. They must put aside their heathen gods and worship the Nine." As an advanced conjuration trainer, he is one of two people that can start the master Conjuration Training quest by telling you to look for Olyn Seran: "If you want to train further, you'll have to seek out someone else. There's nothing I can teach you. I've heard of a Daedra worshipper named Olyn Seran. Very powerful, and might be helpful, if you can find him. I heard he had to flee Morrowind, and is now hiding out in the forests of Cyrodiil. If there are other cultists out there, he's probably with them." Esta página foi modificada pela última vez à(s) 04h20min de 27 de dezembro de 2012.